A local nerd and cosplayer from Kansas City. Love most things Sci-Fi. Put your viewing of the Calrissian Chronicles on hold because Ian and Kris and talking all about the latest Star Wars spinoff movie, Solo: A Star Wars Story. Spoilers for those who have yet to still see this movie btw! Listen as Ian and Kris try to dissect where things may have gone wrong with this movie, talk characters and plot points, the change in directors, that super cool cameo, and why other future Star Wars story movies have been put on a brief hold as of late. Welcome all you Force users to another episode of Echo Station. Today, Ian and Kris dive into one of if not the most popular Star Wars show that has been ever produced. We are of course talking about the Emmy award winning animated series Star Wars: The Clone Wars! Clone Wars recently had its 10 year anniversary panel at SDCC this year so naturally Kris and Ian had to talk about the show, favorite episodes, characters, and so much more. Hello to all you Star Wars fans out there! Welcome to the very first episode of the HPN’s newest podcast series Echo Station: A Star Wars Podcast. Come join hosts Ian (cohost of Costume Couture) and Kris as they talk a little bit about their love for this massive universe, how they got hooked into it, and dive into Episode 9 shooting and casting news! Lets see if we can do this in less than 12 parsecs shall we? This week, we sit down with two of the award winning cosplay group, Another Castle Creations. These cosplayers are known for their wide range of group cosplays that take them to many comic cons each year. They cosplay groups from Marvel, DC Comics, anime, and even more. Join us as we talk about how they got their start, came together, and began winning awards. Costume Couture is back with a Planet Comic Con wrap-up! Then, it’s a discussion on Her Universe, a nerd\geek-centric clothing line for people of all shapes, sizes, and genders. Her Universe was started by Ashley Eckstein and includes licenses for Star Wars, Marvel, DC Comics, Doctor Who, and more! Don’t miss our Planet Comic Con Cosplay Interviews with Jennifer Van Damsel, On My Sophii, Droid Girl Cosplay, and more! You can find Part 1 of 4 below. We interview DoodleSpork Cosplay, Droid Girl Cosplay, On My Sophii, Jennifer Van Damsel, Pros and Cons Cosplay, Another Castle Creations, Starburst Cosplay, and more! 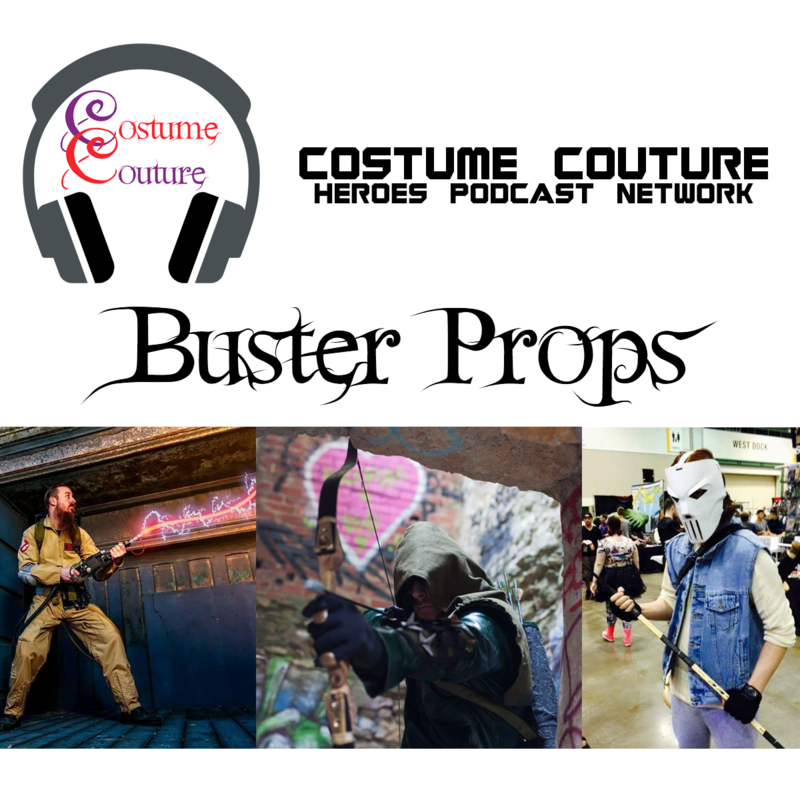 With Planet Comicon this weekend, we sit down with owner and founder of Buster Props to talk about everything they are planning for their booth this weekend. We talk to Ryan about what got him into cosplay and prop building, his experiences in the Dragon Con parade, plus some of the awesome items they are currently working on bringing to the cosplay world. They’ve got 3D printed goodies like a Batman v Superman Batman belt kit, plus modeled and molded cowls like Daredevil and Catwoman. Check out more in the video below! Pretty cool stuff, right? You can check them out in person at Planet Comicon this weekend or hit them up on their pages below. Don’t forget to subscribe on YouTube and give this video a thumbs-up! Costume Couture continues with a look at the entire original X-Men trilogy including Wolverine, Professor X, Mystique, Rogue, Storm, Nightcrawler, and even some more obscure characters. We talk about the black leather look compared to the original yellow and blue spandex, which characters it worked for and which ones it clearly did not. We also discuss some of our thoughts on the movies as a whole, did they do a good job in portraying their comic book characters? You’ll have to watch to find out! In addition to talk costumes and designs, we also welcome our next Cosplayer of the Week, Jason Kiss (AKA The Snarky Gay Guy)! He’s known for his DC Comics’ Nightwing and genderbent Poison Ivy. Check out our second episode below and comment with your thoughts! Costume Couture is hosted by Rae of Super Sirens Cosplay and Ian of Haus of Turner Cosplay. What did you think of our second episode? Subscribe on YouTube and comment on the video with your thoughts on the X-Men trilogy’s costumes and design concepts. We’d love to hear your thoughts. Do you want a chance at being Cosplayer of the Week? Submit a form here! Stay tuned for a new episode every week! Costume Couture will be analyzing all kinds of costumes and styles from Princess movies, sci-fi, fantasy, TV, and more! Plus, we’ll have even more cosplayers and prop builders featured! Costume Couture premieres with an in-depth look at the costumes and styles in Disney’s live action Beauty and the Beast that hit theaters last month. In addition to talk costumes and designs, we also welcome our first Cosplayer of the Week, Shayna in Neverland! She’s known for her Alice in Wonderland Steampunk cosplay and her Lara Croft from the latest Tomb Raider video games. Check out our first episode below and comment with your thoughts! What did you think of our first episode? Subscribe on YouTube and comment on the video with your thoughts about Beauty and the Beast’s costumes and design concepts. We’d love to hear your thoughts.